Type the following link in your browser: https://t2m.io/L1ftxPOs and accomplish the online registration form. All CASH PAYMENTS SHOULD BE MADE at the CCDC Cashier’s Office. The CCDC Cashier’s Office is open Mondays-Saturdays from 7:30 am – 5:30pm. Please keep your receipts and present them during the registration period on February 8. 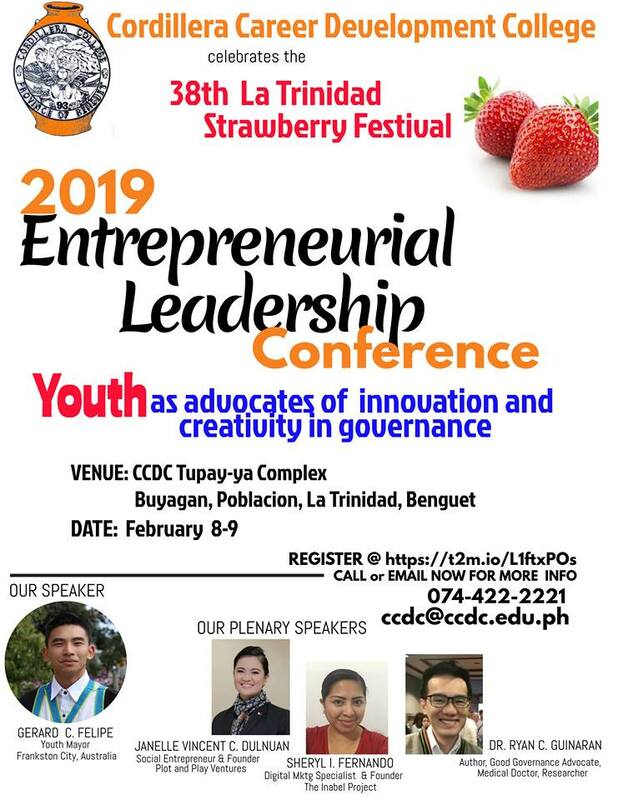 Email to ccdc@ccdc.edu.ph the scanned copy of your deposit slip with the name of the participant or send a photo of your CCDC receipt as a personal message to Cordillera College (CCDC) fb page. A confirmation of your online Registration will be sent to your email only if deposit slip was received by the Secretariat. PhP 500 – to cover training kit, certificate, one lunch and three snacks.